It has come to our attention that some Lewisville residents have been contacted by Waste Industries to become Waste Industries customers for recycling services. 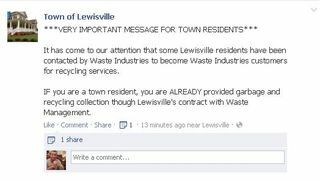 IF you are a town resident, you are ALREADY provided garbage and recycling collection though Lewisville's contract with Waste Management. This entry was posted in Government, Lewisville and tagged lewisville, lewisville north carolina, waste industries, waste management on October 23, 2013 by Jon Lowder.